Often, improvisation albums lack what you would call "tunes". But not this one. David Jackson's new album Jaxon Faces The Jury is weird and experimental like an improvisation album should be, but also has some catchy tunes. Right from the start, violin, accordion, saxophones and other instruments invite us to what sounds like a dance in a Louisiana cornfield. The album has quiet, comtemplative piano moments, but also crazy, haunted saxophone screechings. There are flutes, all sorts of percussion and an occasional incomprehensible voice. The album sounds like this band has been playing together for a long time. But that isn't so. According to the liner notes, the Norwegian trio Le Jury has been together for over ten years, but apparently had never played with David Jackson before. And the whole album was put together from recordings made at a jam session that took no more than one day (in Bergen, 3 October 2002 to be exact). Apart from saxophonist David Jackson himself of course, in particular violinist Ricardo Odriozola to my ears is a well-trained musician, who is a master in subtleties. Hard to imagine that so few players could produce so rich a web of sounds, all in just less than 52 minutes. I can hear many more instruments than there are players on this album. The recording and editing of the sessions sound very professional. I wouldn't be surprised if some overdubs were done lateron in the studio, but I can't really be sure. All instruments can clearly be distinguished, and although some parts are more than 13 minutes in length, others are no more than 40 seconds. At some point, when it almost sounds like the music might reach a dead end or start to sound like film music, a mumbling voice kicks in, or the accordion goes crazy, or a siren-like sound is heard, to introduce some catchy, jazz-like playing. Some other parts sound like they were played in a Parisian jazz-club at four in the morning. The album is an almost constant balance between hesitation and determination, between subdued and dramatic. 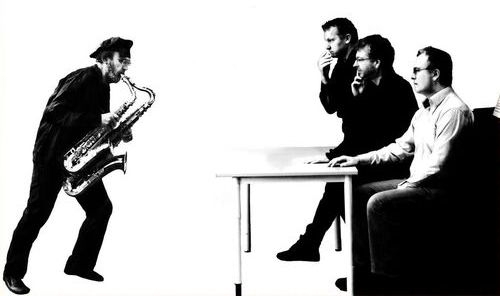 I do believe that the players made some basic agreements before playing a certain section, because it often sounds more jazzy, bluesy or rock than a "regular" improvisation album would. But maybe that's all down to the players' huge experience in music, and especially in improvised music. It's a real joy to hear these four talented musicians play together. When I close my eyes, I can see them in front of me on a stage. Oh, if that would only happen one day...! The album Jaxon Faces The Jury can be ordered via David Jackson's website.